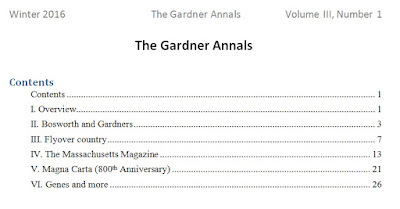 We had our first print of the TGA, last year, when we did Volumes I and II (in black and white) with the first three Volumes of Gardner's Beacon. 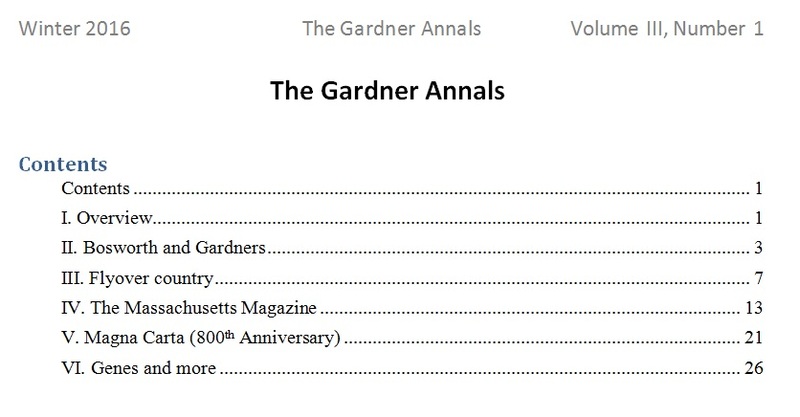 We are finalizing the latest issue of The Gardner Annals which will be Volume IV, Number 1. As soon as we are done with that, we will prepare to print Volumes III and IV of the TGA. We will do the next printing in color. Too, if there is interest, we can reprint Vols I and II in color. As a reminder, the following is the Table of Contents for TGA, Vol III. With TGA Vol III and Vol IV, we will include issues from Volumes IV through VII of Gardner's Beacon. In Vol. IV, we carry forward two of the articles. "Thomas Gardner and the Tudors" is an extension of "Bosworth and Gardners" which is being done by David T. Gardner of the Pennsylvania family. Then, we look at the remainder of the volumes of The Massachusetts Magazine that was published by Dr. Frank and friends from 1908 to 1918. A new subject article looks at a correction made to The Essex Genealogist which led to several articles from Gardner Research. Finally, we briefly look at current research that will be published in future issues: a continuation of the "Flyover country" work about the lonely grave of a Mayflower descendant out west (who cares? when there is partying going on back in Plymouth? ), then we take a look at the founders of The Atlantic which started in Boston, of course, we look further at the Magna Carta, and take some time to refresh what is known about Nathaniel Eaton which the proviso that we will get the record filled out further (he is an ancestor of Dr. Frank). In terms of The Massachusetts Magazine, for which we will publish the Table of Contents the remaining issues, here are some particulars to be dealt with. Dr. Frank gathered old and new friends in order to do this publication. The old timers were from the era of the Civil War: Thomas Wentworth Higginson, F. B. Sanborn, and F. M. Thompson. Dr. Frank had an article in every one of the issues and did his pieces on those regiments at the Siege of Boston. Dr. Frank's sister, Lucie, helped edit and contributed articles. Of note is that she picked up the work of Sidney Perley who retired. Then, she reported on the groups that were meeting, such as the Old Planters Society. There were several other contributors. From reading these, we learned of Count Rumford, traversals out west (bleeding Kansas - Higginson and further west - F. M. Thompson). Too, we read of a friend of Ethan Allen who was here during the American Revolution (J. Hector St. John). And, we now know the Brit (R.A. Douglas-Lithgow, M.D. LLD) who wrote the History of Nantucket. We pondered about the demise of the magazine which was popular. No doubt, the Spanish flu pandemic of 1918 was a factor. From looking at magazines of the time, we learned about the dialog (yes) related to various parts of U.S. history that ought to be known. And, we found out about the Lyceum movement of the early 1800s. The impact was seen even out in Kansas (1890s). We will take time to look at various attempts, such as the Spirit of '76 that was adopted by S.A.R. yet failed. Gardner research interests are varied. One of these would be doing the first five or so generations for each of the children. Now, how to get that further along?